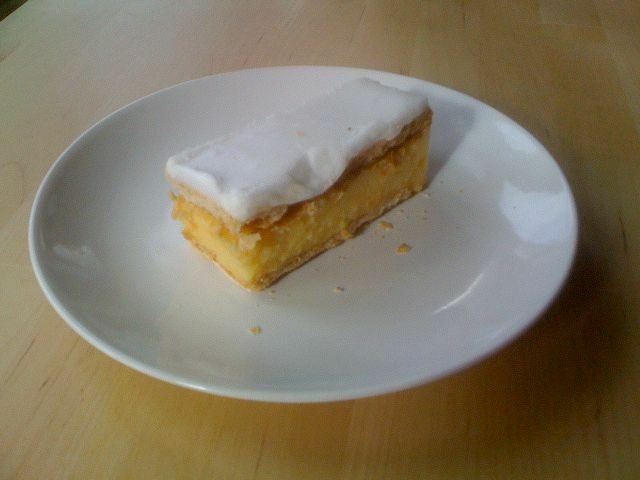 The structure bears more resemblance to a sandwich; the custard is held between two pieces of flakey pastry with the unfortunate effect that any attempt at consuming it results in the immediate evacuation of the custard from the sides. To make things even more challenging, the top is iced to prevent you from gripping it without getting your fingers sticky. Unlike the simpler French patisserie, this is not going to win any usability awards. This is not a custard that Jonathan Ive would have designed. All the same, because of the pastry (which is deliciously reminiscent of a buttery), and the fact that it is the best available delivery method for custard outside France, it is something of an irresistible treat. Albeit one that to preserve dignity should probably only be consumed in private, alone.